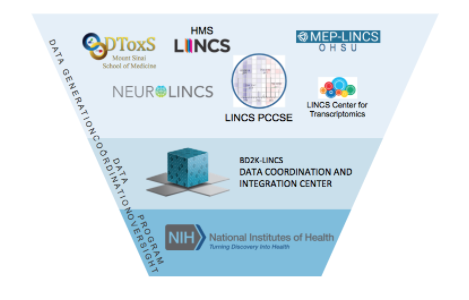 The NIH Common Fund’s Library of Integrated Network-based Cellular Signatures (LINCS) program aims to create a network-based understanding of biology by cataloging changes in gene expression and other cellular processes that occur when cells are exposed to a variety of perturbing agents. By using computational tools to integrate this diverse information into a comprehensive view of normal and disease states that can be applied for the development of new biomarkers and therapeutics. More information about the LINCS project is at http://lincsproject.org. LINCS Phase I Data: GEO GSE92742. LINCS Phase II Data: GEO GSE70138. CMap-HBS-LINCS Contest Data: GEO GSE92743. The Broad LINCS centers also work with the LINCS Data Coordination and Integration Center to make these data accessible at http://lincs-dcic.org. LINCS data from L1000 and Proteomics is integrated with perturbational datasets generated with other funding sources and made available for analysis at clue.io. See relevant articles in Connectopedia: the CLUE Knowledge Base for more information on the datasets available in the CLUE platform.